Who’s excited for Super Bowl Sunday?!!! Okay, confession – I’m not a big Super Bowl Sunday person. *gasp*, I know! It seems like the whole world is on it. But the only time I have ever properly watched the Super Bowl from beginning to end was when the Giants were playing (woohoo, go NY!!) and my friends decided to make a thing out of it. All other years I just made sure to catch the half-time show. That’s really what most of us are waiting for anyway – admit it! Either way, I do know enough about Super Bowl parties to know that it’s all about the finger foods and DIPS!! So I got ya covered! This fresh and nutritious dip is what you’ll want to dunk your veggies, cracker, tortilla chips, or my personal favorite – pita chips. I added some peas for a boost of protein. 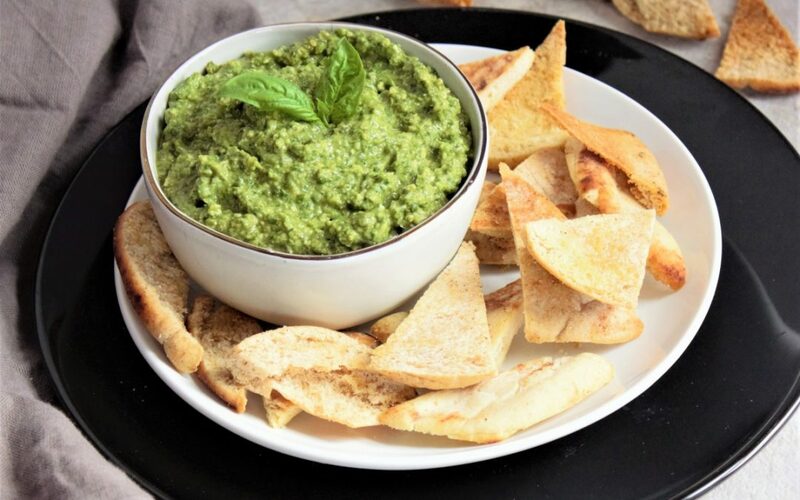 You can barely tastes the peas and it adds a nice chunk to the dip. It will definitely be a crowd pleaser, so make sure to put it on your menu! Place all ingredients into a food processor and blend until it comes together. About 1 minutes. You don’t want to blend it too much, you want it to stay a bit chunky. Transfer to bowl and stores in fridge while you make the pita chips. Split each pita pocket in half (you should end up with 2 circles for each pita). Place on lined baking sheet and coat with olive oil. Sprinkle with salt and pepper. Bake for 15-20 minutes. Make sure to watch them so they don’t burn. They should be crunchy once they are ready. 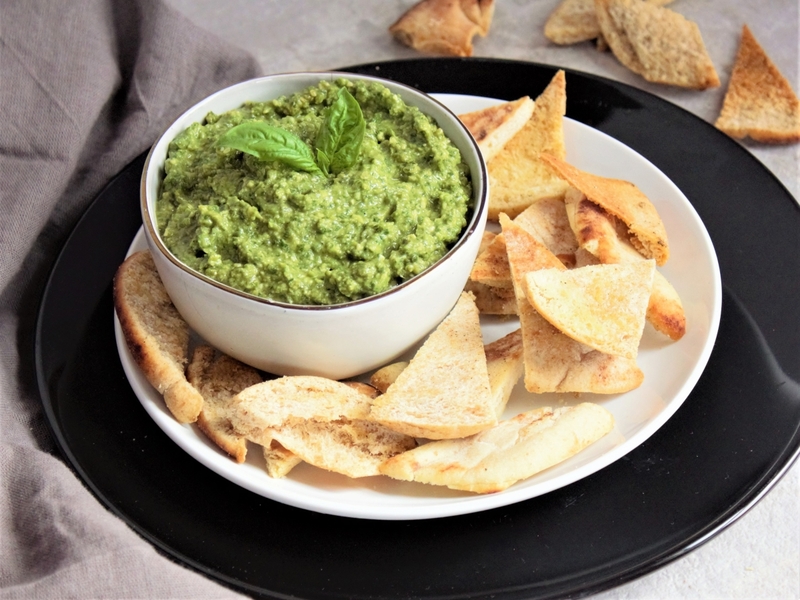 Serve with Chunky Pea Pesto Dip and enjoy!